Left Media And Blogs Begin Racial Attacks On Sheila Johnson BET Founder | Virginia Right! 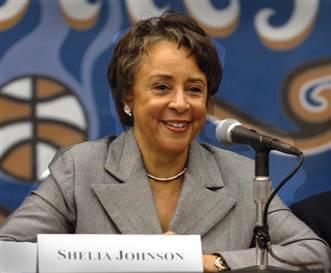 The attacks on Sheila Johnson have nothing to do with her stuttering comments concerning Creigh Deeds. They have everything to do with a successful African-American woman who “don’t know her place”. The left has been looking for an excuse to slam her ever since she endorsed Republican Bob McDonnell for Governor. But saying that would be overtly racist. You are black, so you must be a Democrat. We can’t have that, can we? So, there were grumbles, there were a few blue blogs that attempted to marginalize her. But there was no real way to retaliate against her without looking foolish, and racist. When Ms. Johnson made a joke about Deeds speech patterns, the Media and the lefty blogs suddenly had the vehicle to release the pent up anger at this black woman that does not know her place. How dare she make fun of a politician’s speech problems? They are all wee weed up! So, the same media and blogs that were first in line to giggle with glee whenever President George W. Bush stammered over a word or two are suddenly incensed that a person could make fun of a speech problem. Now do you see the racism? These people really don’t care about Ms. Johnson’s levity at Deeds’ expense. They simply want to punish her for the crime of endorsing a Republican. Plain and simple. By the way, Deeds campaign admits he does not have a speech problem and has never sought medical attention for his diction. He has always talked like that. However, if you pay attention as to exactly when he has a major problem, it is when he is trying to talk out of both sides of his mouth at once. Like saying he will raise taxes and not raise taxes at the same time. Or pretending to be a “progressive” liberal in NoVa and a Blue Dog in Bath. Or supporting collective bargaining to one group of Police Officers and not supporting it to another. His speech problem is more a moral issue. He can solve his problem simply by being himself and telling the truth. But then he will definitely lose the election. But the stuttering does make for one hell of a truth detector. Doug Wilder better look out. The Democrats are all wee weed up over your non endorsement, too. ← Whats the Big Deal With Sheila Johnson? Deeds Only Stutters When He Lies! But not one single thing that you said gives the government the right to stop the mosque. Protest the mosque. Do creative things like building the gay bar next door, but the President was 100% right when he said that they have a First Amendment right to build it there.